For the Serbian film, see Santa Maria della Salute (film). It stands on the narrow finger of Punta della Dogana, between the Grand Canal and the Giudecca Canal, at the Bacino di San Marco, making the church visible when entering the Piazza San Marco from the water. The Salute is part of the parish of the Gesuati and is the most recent of the so-called plague churches. In 1630, Venice experienced an unusually devastating outbreak of the plague. As a votive offering for the city's deliverance from the pestilence, the Republic of Venice vowed to build and dedicate a church to Our Lady of Health (or of Deliverance, Italian: Salute). The church was designed in the then fashionable baroque style by Baldassare Longhena, who studied under the architect Vincenzo Scamozzi. Construction began in 1631. Most of the objects of art housed in the church bear references to the Black Death. Beginning in the summer of 1630, a wave of the plague assaulted Venice, and until 1631 killed nearly a third of the population. In the city, 46,000 people died whilst in the lagoons the number was far higher, some 94,000. Repeated displays of the sacrament, as well as prayers and processions to churches dedicated to San Rocco and San Lorenzo Giustiniani had failed to stem the epidemic. Echoing the architectural response to a prior assault of the plague (1575–76), when Palladio was asked to design the Redentore church, the Venetian Senate on October 22, 1630, decreed that a new church would be built. It was not to be dedicated to a mere "plague" or patron saint, but to the Virgin Mary, who for many reasons was thought to be a protector of the Republic. It was also decided that the Senate would visit the church each year. On November 21 the Feast of the Presentation of the Virgin, known as the Festa della Madonna della Salute, the city's officials parade from San Marco to the Salute for a service in gratitude for deliverance from the plague is celebrated. This involved crossing the Grand Canal on a specially constructed pontoon bridge and is still a major event in Venice. The desire to create a suitable monument at a place that allows for easy processional access from Piazza San Marco led senators to select the present site from among eight potential locations. The location was chosen partially due to its relationship to San Giorgio, San Marco, and Il Redentore, with which it forms an arc. The Salute, emblematic of the city's piety, stands adjacent to the rusticated single story customs house or Dogana da Mar, the emblem of its maritime commerce, and near the civic center of the city. A dispute with the patriarch, owner of the church and seminary at the site, was resolved, and razing of some of the buildings began by 1631. Likely, the diplomat Paolo Sarpi and Doge Nicolo Contarini shared the intent to link the church to an order less closely associated with the patriarchate, and ultimately the Somascan Fathers, an order founded near Bergamo by a Venetian nobleman Jerome Emiliani, were invited to administer the church. I have created a church in the form of a rotunda, a work of new invention, not built in Venice, a work very worthy and desired by many. This church, having the mystery of its dedication, being dedicated to the Blessed Virgin, made me think, with what little talent God has bestowed upon me of building the church in the ... shape of a crown. Later in a memorandum, he wrote: "Firstly, it is a virgin work, never before seen, curious, worthy and beautiful, made in the form of a round monument that has never been seen, nor ever before invented, neither altogether, nor in part, in other churches in this most serene city, just as my competitor (il Fracao) has done for his own advantage, being poor in invention." The Salute, while novel in many ways, still shows the influence of Palladian classicism and the domes of Venice. The Venetian Senate voted 66 in favor, 29 against with 2 abstentions to authorize the designs of the 26-year-old Longhena. While Longhena saw the structure as crown-like, the decorative circular building makes it seem more like a reliquary, a ciborium, and embroidered inverted chalice that shelters the city's piety. While its external decoration and location capture the eye, the internal design itself is quite remarkable. The octagonal church, while ringed by a classic vocabulary, hearkens to Byzantine designs such as the Basilica of San Vitale. The interior has its architectural elements demarcated by the coloration of the material, and the central nave with its ring of saints atop a balustrade is a novel design. It is full of Marian symbolism – the great dome represents her crown, the cavernous interior her womb, the eight sides the eight points on her symbolic star. The interior is octagonal with eight radiating chapels on the outer row. 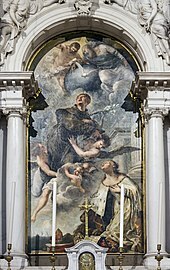 The three altars to the right of the main entrance are decorated with scenes from the life of the Virgin Mary, patroness of the church, by Luca Giordano: The Presentation of Our Lady in the Temple, Assumption of Our Lady, and Nativity of Our Lady. 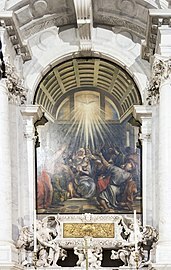 The third altar to the left of the entrance hosts a painting by Titian titled The Descent of the Holy Ghost. The Baroque high altar arrangement, designed by Longhena himself, shelters an iconic Byzantine Madonna and Child of the 12th or 13th century, known as Panagia Mesopantitissa in Greek ("Madonna the mediator" or "Madonna the negotiator") and came from Candia in 1669 after the fall of the city to the Ottomans. 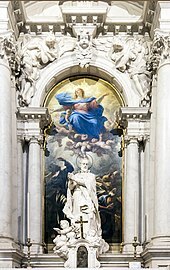 The statuary group at the high altar, depicting The Queen of Heaven expelling the Plague (1670) is a theatrical Baroque masterpiece by the Flemish sculptor Josse de Corte. It originally held Alessandro Varotari's painting of the Virgin holding a church that the painter submitted with his architectural proposal. Tintoretto contributed Marriage at Cana in the great sacristy, which includes a self-portrait. 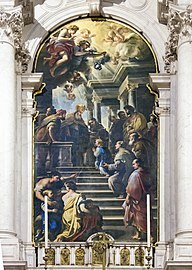 The most represented artist included in the church is Titian, who painted St. Mark Enthroned with Saints Cosmas, Damian, Sebastian and Roch, the altarpiece of the sacristy, as well as ceiling paintings of David and Goliath, Abraham and Isaac and Cain and Abel, and eight tondi of the eight Doctors of the Church and the Evangelists, all in the great sacristy, and Pentecost in the nave. The dome of the Salute was an important addition to the Venetian skyline and soon became emblematic of the city, inspiring painters like Canaletto, J. M. W. Turner, John Singer Sargent, Francesco Guardi, and the Serbian poet Laza Kostić to write a poem of the same title. The church had a large influence on contemporary architects immediately after its completion. The structures modeled after the church include the shrine in Gostyń, built by Jerzy Catenazzi, Jan Catenazzi, and Pompeo Ferrari between 1675-1728, perhaps according to the original design by Baldassarre Longhena. The plans of the Rotunda of Xewkija in Gozo, Malta were based on Santa Maria della Salute, but on a larger scale. ^ Avery, Harold (February 1966). "Plague churches, monuments and memorials". Proc. R. Soc. Med. 59 (2): 110–116. PMC 1900794. PMID 5906745. ^ (in English) "Sanctuary in Swieta Góra". www.filipini.gostyn.pl. Archived from the original on October 13, 2007. Retrieved 2014-10-14. ^ "John Piper: the fabric of modernism". Pallant House Gallery. Hopkins, Andrew (1997). "Plans and Planning for S. Maria della Salute, Venice". The Art Bulletin: 440–465. Wikimedia Commons has media related to Santa Maria della Salute (Venice).